First step to prepare this amazing recipe is to use a big bowl and mix the first 4 ingredient . And after all that you need now to add crackers, one sleeve at a time, then be sure to use your hand to toss to coat the crackers (be sure to do this step gently ). Second step : Now after all that let sit in the bowl while the oven preheats 250 F. And then line a large cookie sheet with tin foil. 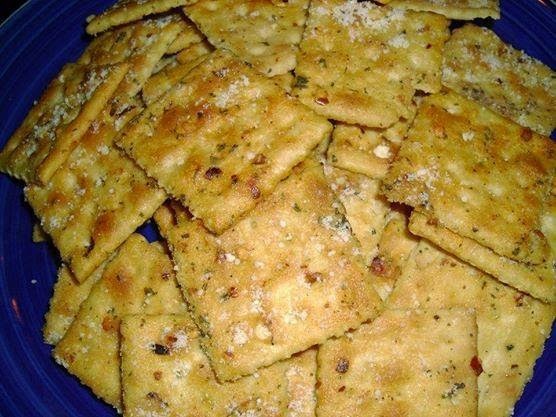 Step 3 : Finally step , in this step you need to spread crackers out on tin foil then bake about 15 mins,then move out & sprinkle with parmesan cheese after that turn the crackers over.And again ,finally sprinkle with more cheese ,return to over about 10 mins. Serve!